Whether your golf game resembles Hank Aaron’s experience as above, or PGA superstar Rory McIlroy’s, one thing remains the same: Quality tools are a must! In the world of promotions, not all products are created equal. From the products themselves to the domes we use for decoration, you can market and sell our golf products with absolute confidence! After balls and tees, one essential on the course is a golf ball marker. 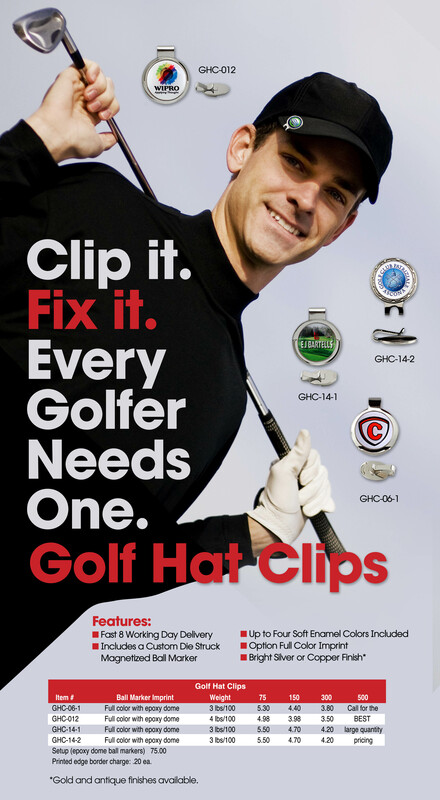 We have a number of options available ranging from a standard ball marker to a hat clip and money clip, and even a hat-clip ball marker option with built-in bottle opener. Like our other golf products, these feature high-quality, full color dome imprint making these fun to hand out and easy to find. Another golf course essential is the divot repair tool. One of the most popular lines we carry are the professional grade, retail product PitchFix. 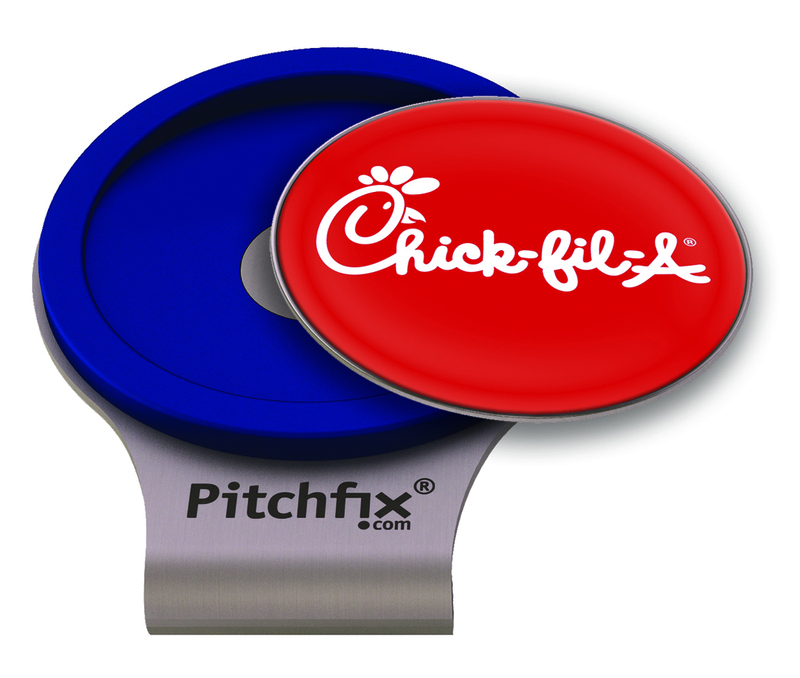 In addition to the original PitchFix line, we recently added the PitchFix 2.0 which features a magnetic base to hold included removable ball marker, 2-sided imprint, spring action, and five options for handle colors. In addition to being an incredible product on its own, we also offer a number of different kitting and packaging options (shown below) for gift giving, retail displays, or awards presentations. Maybe you’re saying, “The PitchFix is incredible, but I don’t have the budget for it at this time” We understand. While the PitchFix product line is definitely something to be desired, we have divot repair tools and golf items to fit almost every budget. Click here to browse our entire line of golf items, and then email customer service to schedule a time to discuss putting together a program that will best suit your needs. We’re confident that with our help, your next golf event will be one of your very best. Why? Because at EMT we make golf promotions EASY! Clip it. Fix It. Every Golfer Needs One. 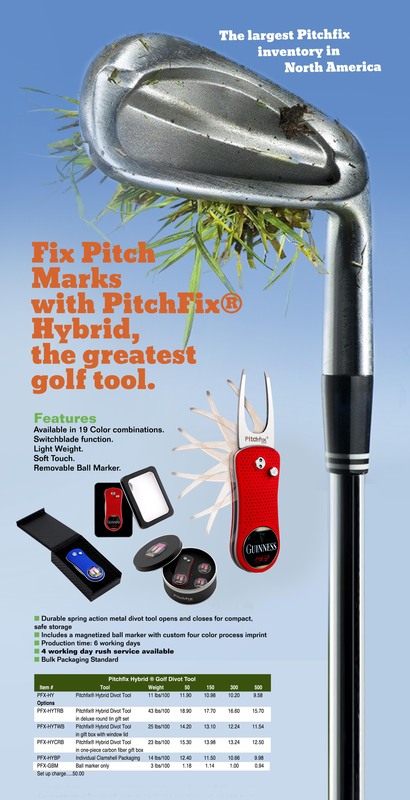 Purposes: The PitchFix® Hybrid is the best golf divot tool on the market. Not only does it come in 19 colorful hues, it’s affordable, light-weight, and has switchblade functionality. A golf divot tool is used for repairing your ball mark on the green—also known as pitch mark. 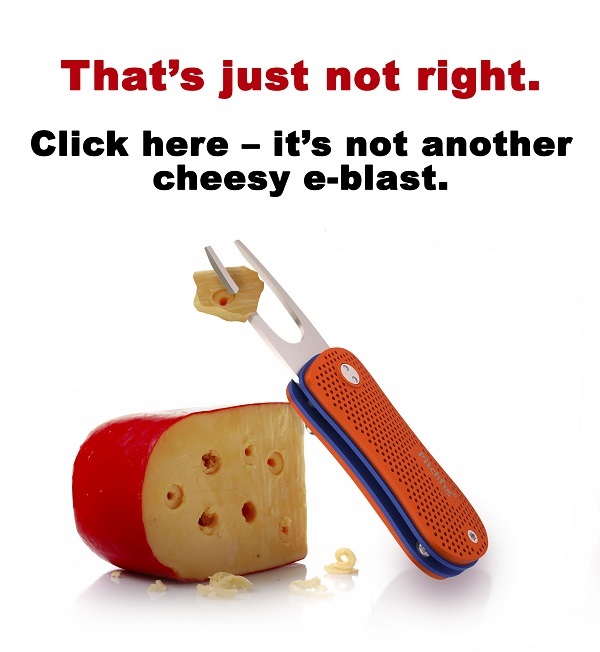 With PitchFix® Hybrid: Simply press the button and the fork will release itself from the handle—like a switchblade. 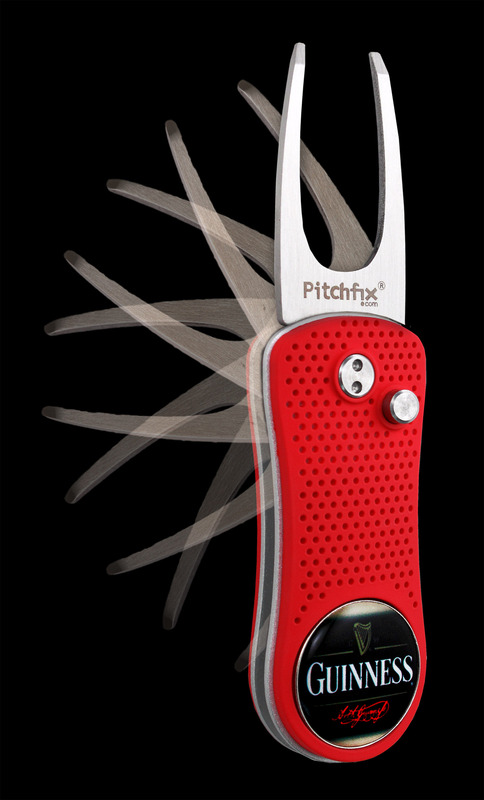 When you’re done repairing your pitch mark just press the button once more and fold the fork back into the handle. Objective: A successful global beer company chose to donate PitchFix® Hybrid Gift Sets to registered golf players for a golf tournament that was held each year to raise funds for heart disease. Registration and sponsorship opportunities were available—in addition, companies could donate branded golf accessories to golf tournament participants. Strategy: The Heart Disease Foundation was selected by the world renowned beer company, because, “it’s a great foundation—not because studies claim that their dry stout beer can actually be beneficial to the heart.” Researchers found that “antioxidant compounds in the beer, similar to those found in certain fruits and vegetables, are responsible for the health benefits because they slow down the deposit of harmful cholesterol on the artery walls.” This branding opportunity allowed the beer manufacturer to raise awareness about heart disease, indirectly associate their brand name with the cause, and do something valuable in the community. The next month, the company’s website experienced a 22.3% increase in traffic. Stop Puttering Around. You need these two golf products from EMT. with this Handy New Tool! Keepsake Coins with Style and Substance! Purposes: Colorful, practical, and unique, PitchFix’s® new hat clips are an affordable promotional product. It’s the ideal product for any golfer, golf tournament participant, or corporate event. Market: Fast Food Restaurant Chain hosts a three-day golf and resort experience including A-list entertainment and PGA player appearances, and culminates in a competitive round featuring professional head coaches and celebrities vying for a scholarship purse of over $500,000. Objective: To raise brand awareness with a practical promotional product that the cameras would capture frequently throughout the event. The additional proceeds from the event benefit other charities created by the fast food restaurant chain. Strategy: By handing out this colorful, modern and practical gift to golfers, not only would the cameras gravitate towards the faces and heads of golfers, but the branding would be very subtle. Although the branding initiative was very difficult to track, website hits did spike to a 20% increase in traffic. In addition, overall revenue for the fast food chain went up 11% in the quarter that the golf tournament was held.